Unique Group has over 30 years of experience in designing and manufacturing buoyancy products for offshore use, we also have the capability to develop innovative solutions for the client requirement when we do not have standard Seaflex products. Unique Group pioneered a first-time solution to mitigate the potential consequences of turbine monopile endcaps failing during a tow through a busy shipping lane. The client, an offshore windfarm installation company, was required by their insurers to add contingency buoyancy to the towing of monopiles across busy shipping lanes to the installation site. Without it, an endcaps failure would result in the unplanned sinking of the structure and an expensive and time-consuming operation to retrieve the monopile from the seabed: a process that would cause major disruption to the project itself, as well as to the shipping lanes which the tow was crossing - and incur significant extra costs. 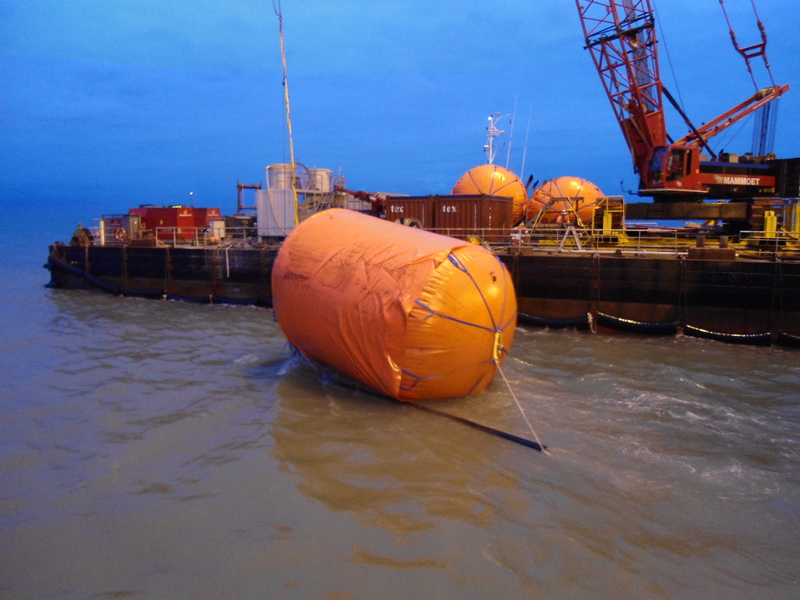 When the contractor’s insurance company insisted upon a back-up buoyancy system for this installation project, we designed and manufactured a prototype 140t buoyancy bag (the largest structure we have ever produced) for client approval prior to rollout of a full set within their required timescales. The jumbo bags were specially fabricated to match the internal diameter of the monopile model: at full inflation the bags were approximately 5.5 metres in diameter and six metres in length and possessed a buoyancy capability of 140 tonnes. Our bags were inserted into the monopile and sealed in place, in case of an endcap’s failure. Once at site, the end-caps were removed and the bags retrieved and recycled around to the start of the process. Our Buoyancy & Ballast division applied its specialist expertise and experience to develop and deliver a customised solution that eliminated the possibility of costly mishaps during the tow-out operation. Safe continuation of the tow-out to the installation location, even in the event of an endcap’s failure.